Jacksonville Bombers starter Matthew Tucker was locked-in. He led his team to a win over the San Francisco Giants, 3-2. The win was Bryan Abreu's in relief. His record improves to 6-5. Jacob deGrom took the loss for San Francisco. Jacksonville leads the National League Eastern Division by 5 games. Chris Norris was the walk-off hero for Jacksonville. 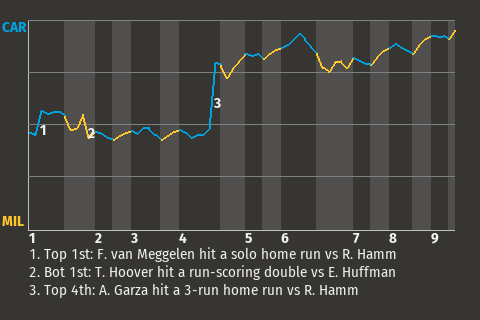 With the game tied in the bottom of the ninth inning, the Bombers center fielder hit a dramatic run-scoring single to send the teams home. "Great to get the crowd on its feet," Norris said.